A visit to Fort Atkinson is not complete without exploring the Hoard Historical Museum and National Dairy Shrine. Suggested donations are $5 for individual or $10 per family. A painted cow and stained glass art greet you upon entering the building. The first room we entered is the Mounds Gallery. We learned a lot about the Indian Mounds in Wisconsin. We saw a short film made my members of the tribes involved. In the same room are arrowhead collections by Raymond Thomas Lawton. The adjoining room has a Native American diorama and more artifacts. And the food they ate, either growing naturally or their own plantings. The museum also encourages visiting Aztalan State Park, which we had! We headed up to the 2nd floor where there was a display dedicated to their local famous poet, Lorine Niedecker. The William Dempster Hoard room, where resides a large portrait of him and his magazine, Hoard’s Dairyman is displayed. The magazine still exists today, in production since 1885! 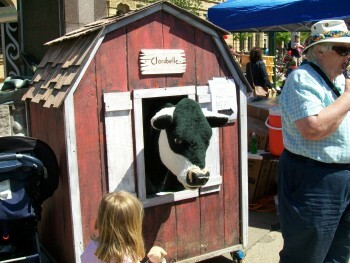 He also went to the Wisconsin State Fair in 1859 and Abraham Lincoln was a guest speaker. Here are his impressions. The Bird Room has MANY birds in display cases, some over a century old. This Bald Eagle is from 1904. Another room upstairs is dedicated to Ft. Atkinson’s Police and Fire Department. The Lorine Niedecker Room in addition to the display near the stairs. The Duck Hunting Room showed hunting around Lake Koshkonong. Canoe information, it may have been owned by William Hoard himself! In the Play Room were toys from days gone by. We went back downstairs to see a representation of how the Hoard house may have looked while occupied by him and his family. Displays are rotated occasionally to display different pieces. The last part we saw in November was the Lincoln Era Library and Exhibit room at the back on the museum on the first floor. It spotlighted Lincoln artifacts, Fort Koshkonong and the Blackhawk War. Fort Koshkonong as it originally looked in this display. Here is what the site looks like NOW. It is presently a residential neighborhood. A great visit to this museum had to be cut short by lack of time to finish it. We’re back! Winter is over and it was time to complete viewing this amazing museum. Flowers were beginning to push up in the garden in front of the museum. These are Iris Reticulata, planted by museum volunteers. Beautiful! We never got to see the dairy shrine side of the museum in November so we got back today. It took about 2 hours to see this part, it occupied the main floor and downstairs. We entered into a large octagon-shaped room with a variety of displays and dioramas. Going around the perimeter of the inside of the room was a timeline history of the Hoard Museum and dairy technology developments. Volunteer Joe Slaney (Volunteer of the Year!) began the presentation in the room, we moved from exhibit to exhibit in a clockwise direction, everything was cued to audio and video, a 3D presentation! The presentation began with a video introduction about the Hoard Museum, then it instructed us to move left to the next panel. This panel showed the many ways milk products were marketed to the consumers from 1 to 92. One of the most successful was the “Got Milk” campaign. 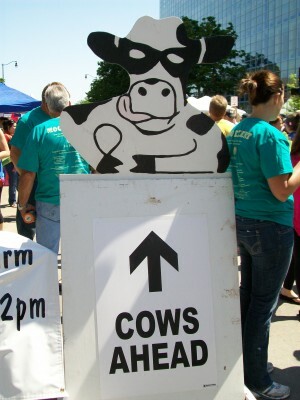 Al and I participated in this when we went to Cows on the Concourse. Here is our milk mustache photo. A display depicting the dairy farmer in the 1800’s, also a room where ice blocks are stored that were cut from a nearby lake in the winter. 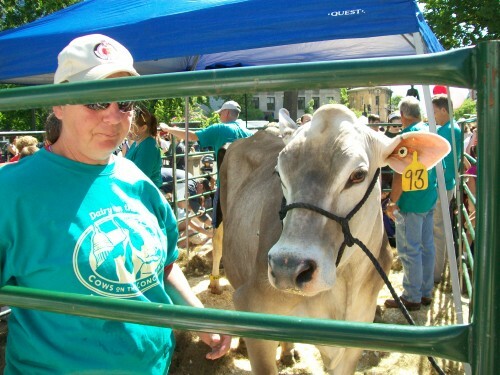 After her husband (or farm hand) milks the cow, she is responsible for processing the milk into butter or soft cheese. She often has a custom butter mold with her own unique design inside, marking it as her “brand”. She then sells the butter to her town’s general store for store credit or cash. Here are a couple of butter molds on display in the museum. Milk is now delivered to the cheese factory in large trucks, from there all kinds of cheese are made. We saw that in Arena and Rudolph. That was an AMAZING presentation! In the center of this room is a library with dairy industry books and magazines. We completed our visit by seeing the other MANY artifacts, too many to count. Here is an array of butter churns. We will close our visit with a painting of the 7 Wonders of Wisconsin, the 7 cow breeds predominant in this state. This museum was well worth the time to see and we will return again to see any new exhibits, as they rotate some of them. Thank you Frank Hoard for this gift to the community. 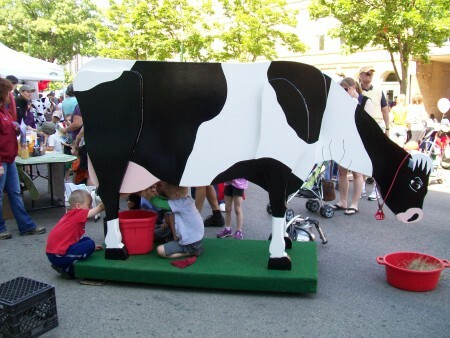 Cows on the Concourse – June is National Dairy Month! 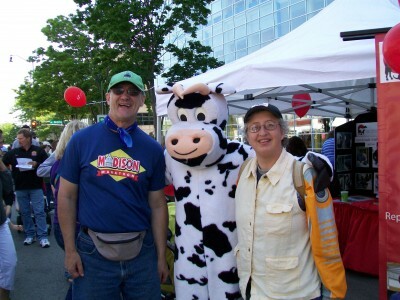 You can’t have Wisconsin without cows, and this event celebrates them and National Dairy Month. 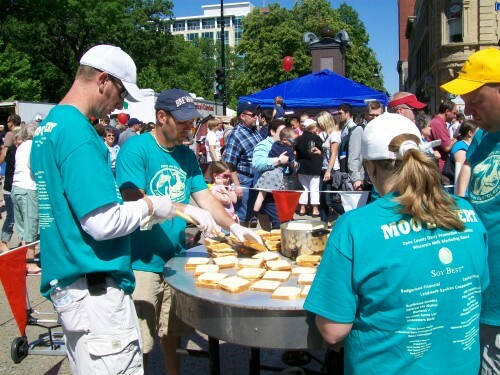 The “concourse” refers to the Capitol Square in downtown Madison. It’s fun for adults as well as kids. you will also meet the young lady representing the Wisconsin Fairs and agriculture with the title, “Fairest of the Fair.” They are chosen on a yearly basis. 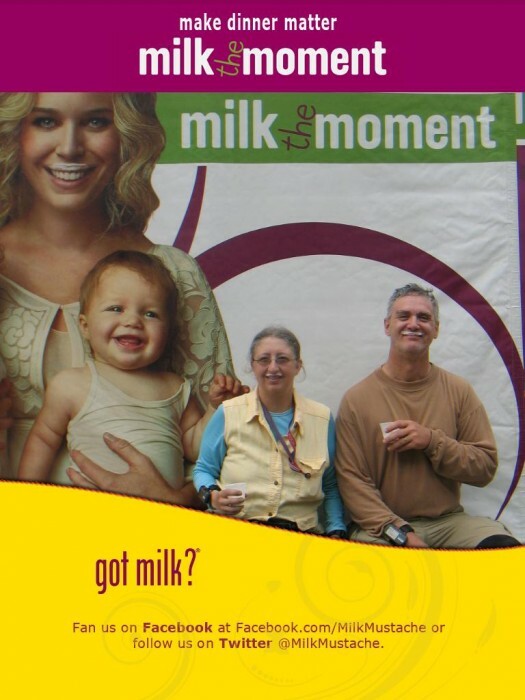 A few years ago the big promo was the Milk Mustache Campaign and we got a funny picture. When you get hungry, there is lots of dairy foods for sale, grilled cheese sandwiches, ice cream and cold milk. Come on by for a great time. 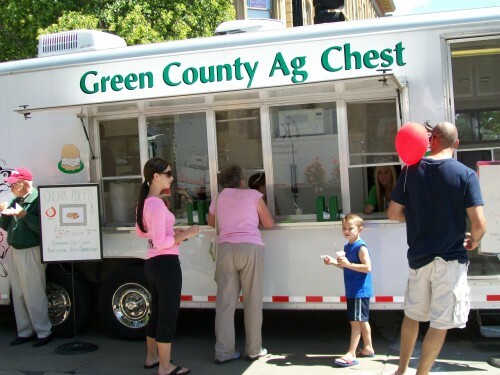 Don’t forget, the Dane County Farmers Market is going on too.